My charger control project relies on the electric vehicle tracking the charge current set by the external EVSE / charger to maximise use of the solar panel output. Most vehicles would readily follow such a signal, but not the Ampera. The Ampera is designed to default to charging at 6 Amps when using a Mode 2 cable (that is one with a household plug). Such a cable normally signals 10 Amps to the vehicle (a safety margin inside the UK’s 13 Amp domestic plugs) but the Ampera is designed to draw only 6 Amps by default. To enable the Ampera to charge at 10 Amps the user has to permit this for every charging event individually. This screen is reached by selecting Charging | Charge Current. 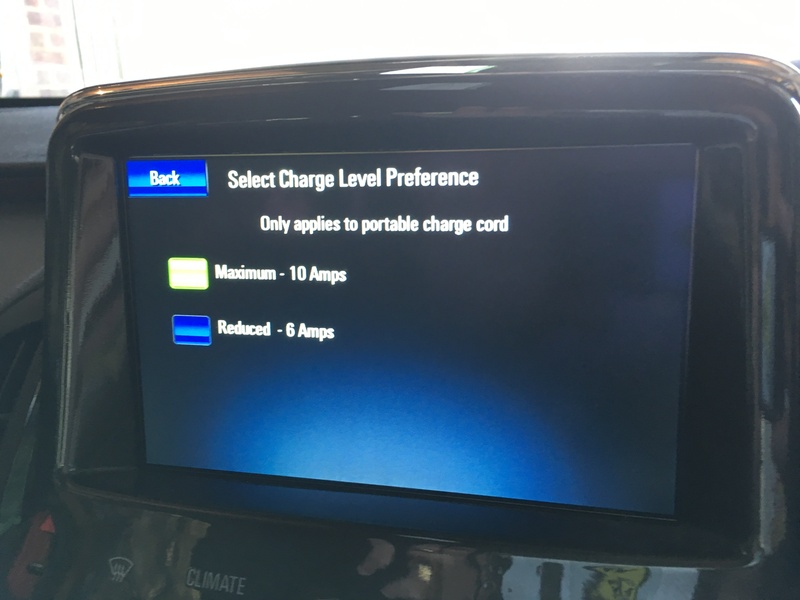 Typically I would push the button in the driver’s door to open the flap over the charge port / vehicle inlet and then select the charge current via the touchscreen before leaving the vehicle. 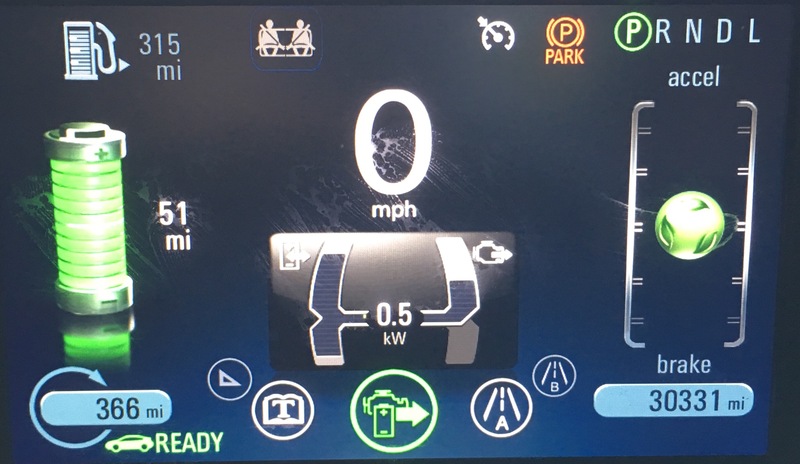 With my Ampera, if the 10 Amp setting is not selected, then the EVSE / charger risks going into an error condition as the Programmable Logic Controller (PLC) expects the control signal from the ImmerSUN to turn off after a few minutes as rising vehicle current should cause the ImmerSUN relay output to cycle on and off around the available current limit. If the 10 Amp setting is effectively disabled then one might not reach the point at which the relay cycles within a reasonable time which the PLC will detect as an error. This entry was posted in Charger control project, Transportation on 08/07/2018 by Greening Me. I’ve just had the Ampera serviced and MOT’d at the end of it 4th year, so how has the Ampera been going? The Ampera is a 4 door, 4 seat, plug-in hybrid car. Unusually for its size it has only four seats as its traction battery is T-shaped occupying the central spine of the vehicle (thus no center rear seat) and then across the Vehicle under the rear seat. By default it runs as an electric vehicle for up to 50 miles or so depending on driving style, heater use etc, and then runs as a petrol-electric hybrid once battery charge reaches a minimum level; although the driver can choose ‘hold’ mode which seeks to save electricity for later (thus using petrol now) so you might drive to the city as a petrol-electric hybrid and then drive within the city as electric. More recent plug-in hybrid vehicles would include Mitsubishi Outlander PHEV, BMW i3 Rex, and Toyota Prius plug-in hybrid. Compared to Outlander, Ampera is a car (not a SUV) with fewer seats but more range. Compared to BMW i3 Rex, Ampera looks more conventional, has fewer electric miles range, more petrol miles range, and a more complex driveline where petrol engine torque can be transmitted to the wheels (rather than conceptually being more of a generator in an electric car). Compared to Prius, Ampera has more electric range power and performance, and a more sophisticated driveline allowing the petrol engine to be detached from the driveline to allow both electric machines to propel the car, or splitting the driveline to create a BMW-like generator feeding an electric car. Dual motor mode – divorces petrol engine from the driveline allowing both electric machines to propel the car – more sophisticated that Prius providing improved electric-only capability. Range-extended mode – splits the powertrain into a BMW-like generator set and a single-motor electric driveline – used at lower speeds. Mechanically-coupled – a motorway speeds the Ampera links the petrol engine to the driveline allowing engine torque to be transmitted to the wheels in a Prius-like manner for better efficiency. Anyway, this was supposed to be a 4-year update, not a technology summary. Electric range is always somewhat seasonal (worse in winter, better in summer), and this summer I’m now seeing 50+ miles reported as the range after a full charge which is effectively 2 days of typical weekday use. No evidence of battery degradation there. It’s been pretty reliable over the 4 years. It’s been attended to once by the AA when the vehicle wouldn’t start enough to drive but was locked in a sort of limbo between on and off. AA diagnosed a steering lock issue which they managed to reset making the vehicle driveable, but Vauxhall recommended replacement of the steering lock. The sound it now makes suggests that an older solenoid-based steering lock has been replaced by a motor-driven one which makes a distinct buzz rather than a click. I bought the Ampera principally for local use, cross-shopping against full battery electric vehicles (BEV), correctly anticipating that the Ampera had enough electric range for my daily use at a price considerably cheaper than the full BEVs. However we increasingly use it for longer journeys as it’s big enough for our holiday luggage (2 adults plus 1 child) and, even when the battery is exhausted, is our most economical car. Although now an older design, I’m not conscious of a more capable PHEV (apart from the BMW i3 Rex) so little incentive to upgrade. However the alloy wheels are now peeling quite badly, so I’m likely to get those refurbished soon. This entry was posted in Transportation on 07/07/2018 by Greening Me. The green ‘hill’ from around 3:30 to 7:30 AM is created by car charging. Normally this would be seen as a rectangular block as the car charger effectively runs at a constant 10 Amps (2.3 kW) through the operating period. However in the illustration the charging event (at least in terms of power drawn from the grid) seems rounded at both the beginning and the end. At the beginning of the car charging period the mustard ‘Device Power Out’ curve shows the last remaining stored energy from yesterday being drawn from the PowerVault, while at the end of the charging period the ramp down is a result of increasing output from the solar panels reducing the need for power from the grid. Hence at the moment the car charging ends there’s a sudden switch to charging the PowerVault at full power (the blue line) and some surplus power not used by the PowerVault (the purple line) – suggesting that something around 1 kW is suddenly available. Although the purple line is described as ‘Grid Power Out’ that’s not strictly true here as much of that surplus is being diverted to make hot water (although this is invisible to the PowerVault). After that digression, my actual purpose in making this post was to reflect upon relative energy costs and the best use of my solar power to reduce energy cost. Battery storage – I currently only charge the battery storage from solar, although there would be a seasonal economic argument to charge from cheap rate electricity if the differential between day and night rates was higher. Car charging – I generally charge on cheap night-rate electricity when I don’t have enough solar. In summer I program my car charger via the ImmerSUN’s 7-day timer to deliver sufficient charge for the day ahead, but sufficient headroom to make use of any available solar. Water heating – water heating is my 3rd priority for solar self-use and is automatically based up by the gas boiler which runs for an hour making hot water in the early evening if the tank isn’t already hot from diverted solar power during the day. The gas thermostat is also set slightly colder than the immersion heater – still very usable for a bath or shower from gas but giving some ability to delay water heating from a dull day to a following sunny day. Space heating – my space heating is generally gas. It would be possible to run a heater (or heaters) such as storage radiators via the ImmerSUN’s third output, but I consider that the cost of the heater(s) and installation is unlikely to be recouped given the major mismatch between surplus solar generally being in summer and heat demand being in winter. This entry was posted in Electricity storage, Energy, Energy Smart, Transportation on 01/07/2018 by Greening Me. Today my energy supplier Tonik wrote to me inviting me to consider solar panels, a car charger, or a storage battery – all of which I already have. However on their website I found a wider vision of the future home which they thought could halve energy consumption. I thought it would be interesting to compare their vision with my status. As you can see from the table below the content is quite similar, although I have more ambitious use of solar and more sophisticated smart heating management. Switch to Tonik for lowest cost renewable electricity. Done. - Surplus solar electricity diverted to charge electric car. - Surplus solar electricity diverted to heat water. This entry was posted in Electricity storage, Energy, Smart Home, Solar PV, Transportation on 21/09/2017 by Greening Me. I’m now 2 years into my Ampera ownership. My average fuel economy is 207 mpg reflecting the fact that most of my 8,000 miles per year is driven on electricity, indeed I think that I last filled up with petrol in January and it’s now August. I have about 60 miles worth of petrol left which may see me into September. Most of my mileage is of course powered by electricity. Domestic electricity is much cheaper than petrol anyway, but much of my charging (particularly in summer) is free because I use my own solar power. Obviously the solar system itself is not free, but the money it earns from generating electricity and supplying it to the grid does not depend on what I actually supply to the grid or how much I use. It makes no difference to my revenue how much of the electricity that I generate goes into the grid, making my energy costs when using my own electricity zero. 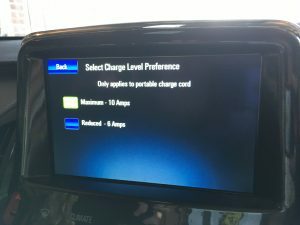 My charger control project describes the development of a solar-powered charger which, in its current form, charges the car at a variable rate depending on output from my solar panels. When the output of the panels is too small to charge the car, or there’s a small surplus while charging the car, or the car is not plugged in, then any surplus solar power is diverted to the immersion heater; but when the car is plugged in then its charging is prioritised over hot water. That priority reflects the relative costs: night time electricity that I would otherwise use for car charging costs me around 8 p/kWh, while gas that I would otherwise use for water heating costs me only around 3 p/kWh. Thus every kilowatt of solar electricity used to charge the car that otherwise would have been exported saves me 8 pence; while every kilowatt used for car charging that otherwise would have been used for water heating saves me around 5 pence. Those savings might sound small but I’d estimate that I’d otherwise buy around 2,500 kWh of electricity annually for charging the car (around £200 at night rates) for car charging – far cheaper than the equivalent distance in petrol but £200 is still money worth saving. This entry was posted in Transportation on 18/08/2016 by Greening Me. After seven years of Wizzing the time had come for a change. Back in 2007 there was little else available, but electric vehicles have come on a long way in that time. The most significant driver for a change was something larger that we could get the whole family in – the G-Wiz notionally has four seats but the rear ones are too small for adults or car seats effectively making the G-Wiz a 2+2. I considered various alternatives and eventually settled on a Vauxhall Ampera encouraged by a substantial discount. 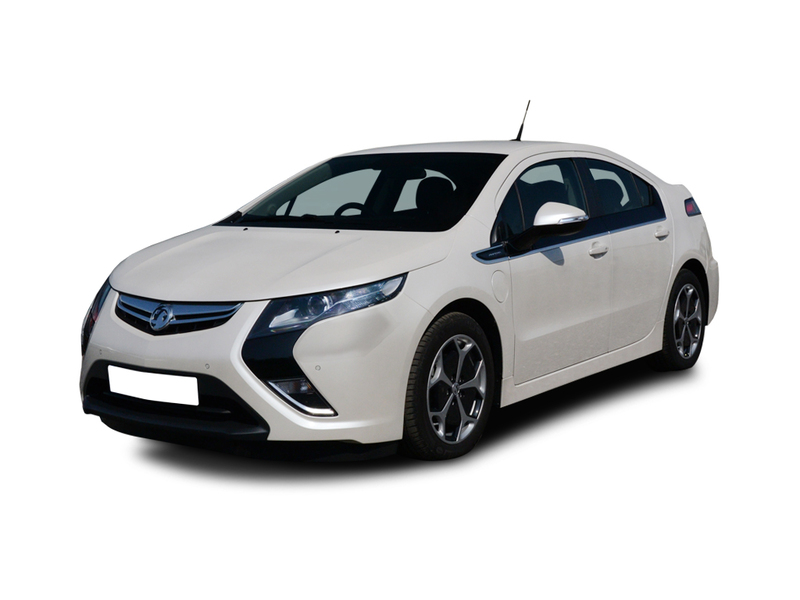 The Ampera is a four seater hatchback with an electric range of up to 50 miles. It’s actually a plug-in hybrid, so it initially runs as a fully electric vehicle, but then when the battery is exhausted it runs as a petrol-electric hybrid. Most days (and indeed weeks) I use no petrol, but occasionally I can do long trips of a few hundred miles without stopping to charge. For most of the period of my ownership my lifetime average economy has been 250+ mpg, but that’s dropped to 190+ mpg following a few round trips to Cheshire. This entry was posted in Transportation on 28/03/2016 by Greening Me. Buy a more fuel efficient model. Buy a Diesel rather than a petrol vehicle – but be cautious the CO2 saving is not as marked as the fuel economy benefit might suggest. Use a renewable fuel such as E85 – but for me the nearest source is Ipswich which is many miles from my home in South Essex. Buy a hybrid such as a Toyota Prius. All of those can make a difference depending on what you currently drive, but I went further than that and have reduced my CO2 emissions from personal transportation by about 90%. Now I suppose that I could have used my bicycle more, but then a 7 mile trip to church or rehearsals would leave me hot and sweaty and it wouldn’t be practical to carry much music or my keyboard, so..
My G-Wiz is able to complete over 40 miles on a charge, and is responsible for no CO2 emissions since it is charged on renewable electricity. I reckon that I can do about 90% of my mileage in it. It’s not quick and it’s not pretty (in my opinion although some call it “cute”), but it is very green despite being black. This entry was posted in Transportation on 08/09/2007 by Greening Me.